Is there anything better than a cup of tomato soup and a grilled cheese sandwich for lunch on a cool fall day? Well, I hate to admit it but I have never been really big into tomato soup. My husband, on the other hand, loves it. So I have searched and searched for a recipe that would allow us both to enjoy it. Eureka! By roasting the vegetables in a delicious balsamic marinade and adding heavy cream at the end I am now a tomato soup convert!! 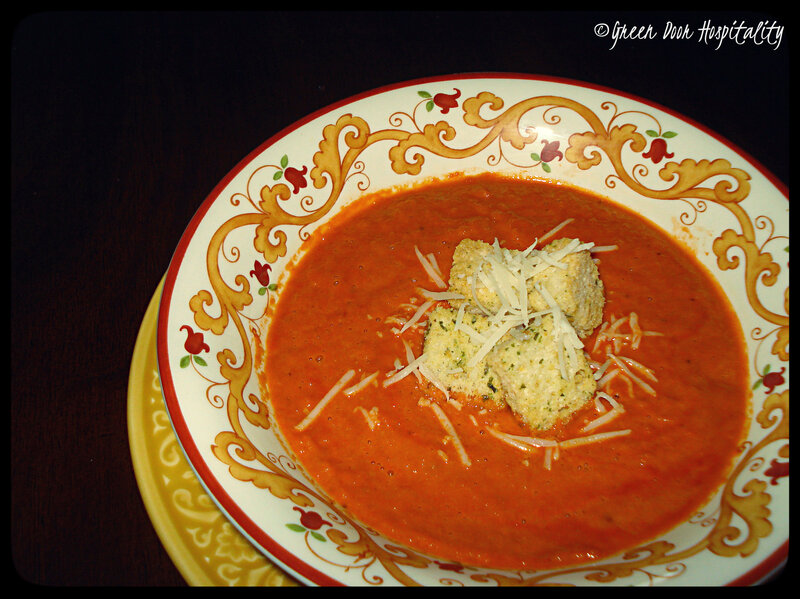 It’s creamy and savory with a wonderful depth that I always felt was a bit missing with some other tomato soups. Combine 1/2 cup broth, sugar, vinegar, and soy sauce in a small bowl and whisk together. Place onion, garlic, and tomatoes in a baking pan coated with cooking spray. Pour broth mixture over vegetables. Bake for 40-50 minutes or until vegetables are lightly browned. Pour tomato mixture into a blender. Add remaining 1/2 cup broth and the cream. Season with pepper and salt. Process until smooth. If necessary, strain mixture through a sieve to remove any solids. Garnish with Homemade Croutons and shredded Asiago cheese if desired. Ha! I thought I was the only one who didn’t like tomato soup. I’ll have to give this recipe a try. Thanks for sharing! This looks SO good! Soup is just the best. Do you make croutons from home, or do you purchase them? The croutons on this soup look delicious. Oh boy… DUH! Clearly you can tell my brain isn’t plugged in correctly today. Thank you for directing me to the recipe! Tomato soup and grilled cheese sandwich is my idea of heaven so I don’t need any coaxing where that’s concerned but I DO love your creative improvisations. Love the idea of balsamic vinegar with it. gotta try! We have the opposite problem, I love it he hates it! This sounds so deliciously different I can’t wait to try this to see what he thinks! Thanks Kenley! This sounds so different and so good!! Thank you Cynthia! 🙂 Glad you think so! Adore that you added in balsamic! I had a monster tomato soup and grilled cheese craving last week that hasn’t yet gone away. Going to try adding this ingredient into mine, too! I agree that tomato soup can be a bit meagre. If I serve soup it fills my son up too much and so it needs a bit of oomph! This looks good! This looks fantastic and of course I am a huge soup fan. Pinning! Oh yum. Tomatoes + balsamic are such a good combo, but I never would have put them in soup together! Adding this to my winter recipe plans. Thanks Alicia! Let me know if you end up making it! I am totally obsessed with adding balsamic to everything so I am not quite sure why it never occurred to me to add it to tomato soup. I will have to scour up some tomatoes here in Minnesota to make this bad boy. This entry was posted on November 5, 2013 by Jessica Romigh in Lunchtime Hospitality and tagged balsamic vinegar, brown sugar, Cooking Light Magazine, garlic, gluten-free, heavy cream, plum tomato, soup, soy sauce, tomato balsamic soup, tomato soup, vegetable broth, vegetarian, yellow onion.